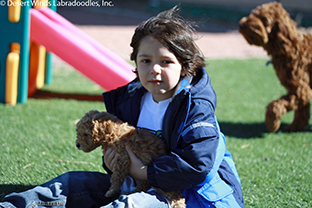 Desert Winds Labradoodles puppies are aptitude tested at 7 weeks of age before going to their forever homes. We use the Volhard Puppy Aptitude Test (PAT) to help us place the right puppy with the right family. A puppy’s behavior is influenced by many factors such as environment, socialization, and training. While we know that most families want to pick their puppy based on attraction to looks, color, or coat type, we encourage everyone to put those secondary to the training and development needs of the puppy which fit’s your families needs best. The test shows what kind of temperament your puppy will have, but can also be used as a tool to help you know what (if any) areas to work on in your puppy’s development if you wish to change certain characteristics. Puppies learn very fast and if trained correctly will turn into the wonderful companion we all desire! If you don't work on changing any of the characteristics, then you can expect your puppy to have the same traits as found on this test at 7 weeks of age throughout it's life. Social Attraction..........This shows the degree of attraction to people. Following......................This shows the degree of willingness of the puppy to follow a human. Restraint.......................This shows the degree of acceptance of restraint. Elevation Response....This shows the response to humans while in a position of no control. Retrieving ....................This shows the degree of desire to retrieve. Touch Sensitivity..........This shows the degree of sensitivity to touch. Sound Sensitivity.........This shows the degree of sensitivity to sound. Sight Sensitivity...........This shows the degree of response to a moving object. This test is very effective for placing the right puppy with the right family, especially those families looking for an Australian Labradoodle to serve as a service or therapy dog. Please consider placing an application for a puppy and allowing our temperament tester to choose the right puppy for you/your family based on the results of the PAT test performed at 7 weeks of age.